Nothing says "Boys Night" like poker night. 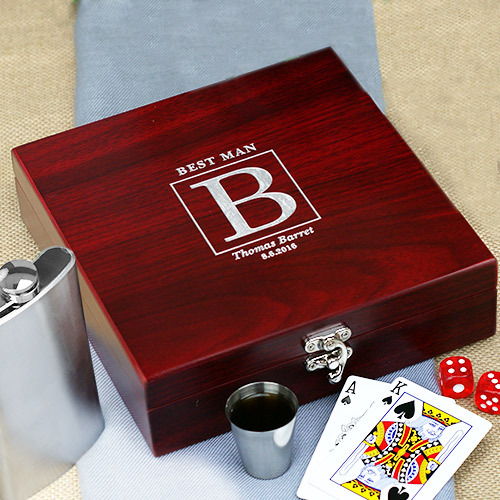 Your husband and his groomsmen can enjoy many fun-filled nights of poker and celebrations when they play out of our engraved poker playing cards and flask set. Complete with a metal stainless steel flask. Personalized this poker set with any title, last name initial, any name and any date. This would be a stellar personalized gift to give to his side of the wedding party! Additional Details Our personalized groomsmen gift selection includes a variety of items that his side of the wedding party will love. 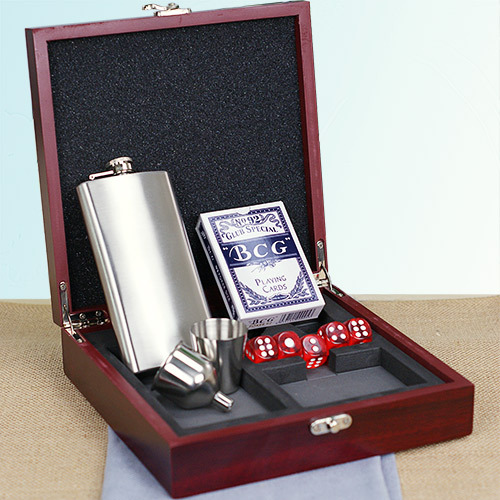 They'll enjoy nights in with their friends with our poker set with flask. Our Poker Room Personalized Coaster Set would go great with this gift.